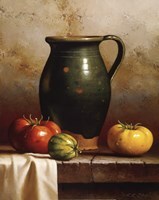 This art print is a still life by T.C. Chiu named Quilt, Pitcher and Apples. The name of the piece describes exactly what's in the print. 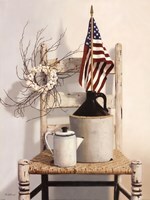 A quilt with dark blues, browns and beiges is draped and leaning on a wooden counter. Setting on the quilt is a brown flower pot filled with ivy and a basket with a white, patterned handkerchief. Red apples sit on the handkerchief and fill the basket. Some of the apples are also placed around the basket directly on the quilt. 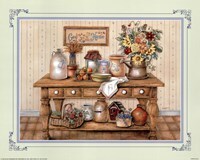 A white vase sits on the far left of the basket. It is trimmed by a blue pattern on the bottom of it. Branches stick up from the background of this piece, they have small round red berries on the tips of them.